It is ideal to do everything possible to save your own teeth, but sometimes that just isn't possible. We will look at all the treatment options available to you, and most of the time, we will suggest the ones that will enable you to preserve your teeth. While there is no perfect substitution for your own natural teeth, it is possible to get well-made dentures that look completely natural. The results can give you a healthy smile and renewed confidence. 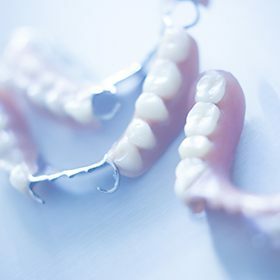 These are the type that comes to most people's minds when they hear the word “dentures.” They are used when all your teeth have been removed. The upper dentures are held in place by suction, and the lower dentures just rest on the ridge. While we work hard to give you the tightest fit possible, the dentures will move slightly when you talk or chew. Most patients adapt to this quickly. Over time, your jawbone will shrink and the dentures will become looser, so they need to be relined every few years for maximum fit and comfort. Partial dentures are used when you still have several healthy teeth. This type of tooth replacement can be made of porcelain, acrylic, or composite teeth which are set in a gum-colored plastic. There are two options for attaching it to your remaining teeth - with a metal framework and clasps, or with a pink translucent framework and clasps. Partial dentures are a relatively quick and economical way to replace your missing teeth. Overdentures can help stabilize a pair of complete dentures. Even at their tightest fit, there may still be some moving around. 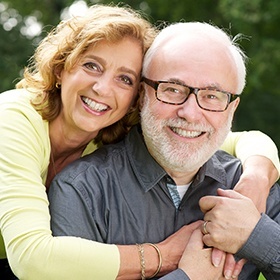 To lessen this, we can place the denture over the roots of a couple of remaining teeth, or we can use two or more dental implants to anchor your denture. 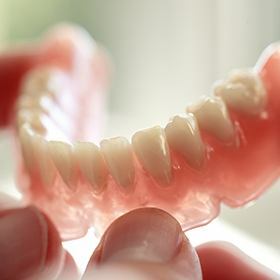 When an overdenture is placed over your own teeth, which are usually the cuspid teeth, the teeth are ground down, root canal treatments are done, and the denture is made to fit over them. This method has several benefits: They won't move when you eat or speak, they are less likely to fall out at embarrassing times, and they will improve your chewing ability. To read more about implant overdentures, please see our dental implants page. If you are ready to get your smile back, you can call our office to set an appointment, or you can click here to request an appointment online.